New York City is quite the literary town, but there is one place I hear about repeatedly in my line of work. 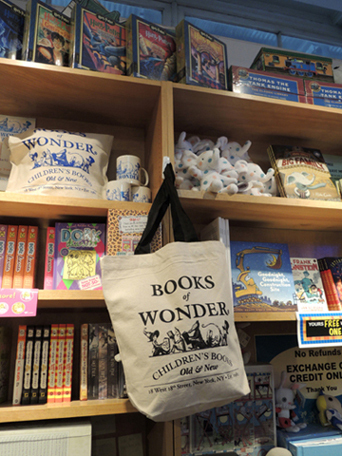 The famous, fun, and fabulous children’s bookstore, Books of Wonder. 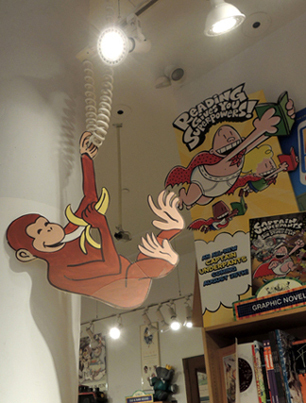 On a recent trip to the city, Katie and I stopped by their 18th Street location to bask in the stuff of legend. 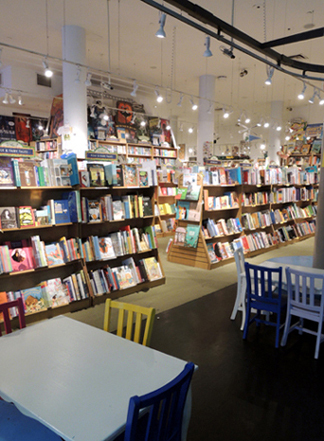 Independently owned and operated, Books of Wonder first opened its doors in 1980. Originally slated to sell antiquarian children’s books, the stock soon expanded to encompass new children’s books as well. In 37 years of business, Books of Wonder has moved, expanded multiple times, coordinated events both large and small, launched a publishing division, and become the keepers and champions of Frank Baum’s Oz books. 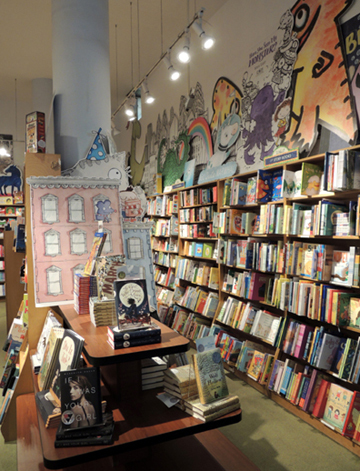 Another interesting fact – Books of Wonder inspired the setting for the children’s bookstore in You’ve Got Mail, right down to being measured, photographed, and rebuilt on the movie’s sound stage. 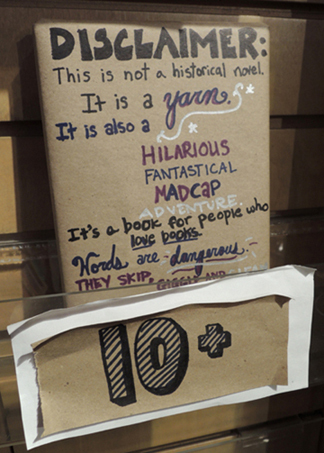 Books of Wonder is PACKED with a huge selection of books. The books are so enticingly displayed, you just want to grab one and read it right away (and plenty of readers were camped out on the floor and in little chairs, doing just that). 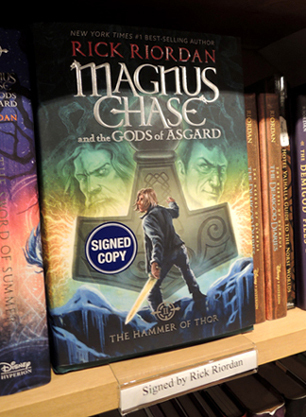 They have quantities of signed copies too. Katie left with not one but two signed copies of The Girl Who Drank the Moon (the 2017 Newbery winner). 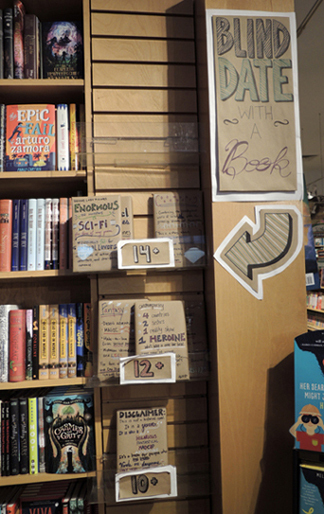 Once I torn myself away from the stacks, I turned my eyes to the quirky and inviting decor. 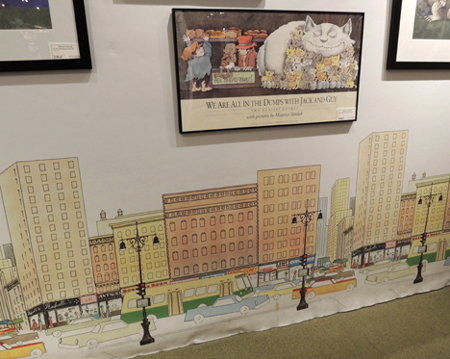 Layered on endcaps, tables, walls, and bookshelves are posters, original artwork, and characters from illustrated books. It almost feels like you’re inside some sort of awesome pop-up book. Do you recognize the dragon in the image that started this post? 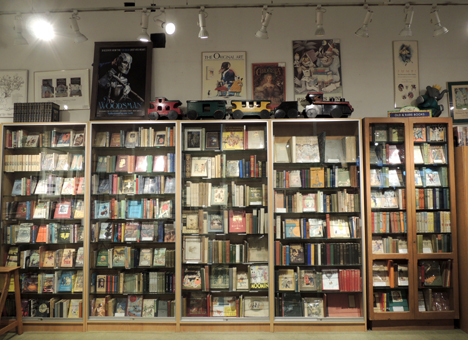 The back wall of the store is dedicated to Books of Wonder’s extensive antiquarian and rare books section. Here you can find an amazing array of your favorites. 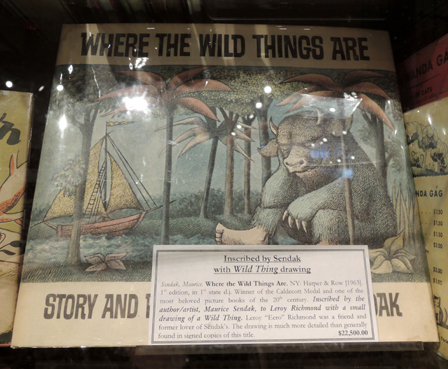 If you’re wondering how much a first edition of Where the Wild Things Are (inscribed, with an original sketch) is going for these days, it’s $22,500. Not far from the rare books, I was delighted to find a real live author signing books! In fact, I shouted across three shelves of retail space to tell Katie that Rowboat Watkins was in the store. 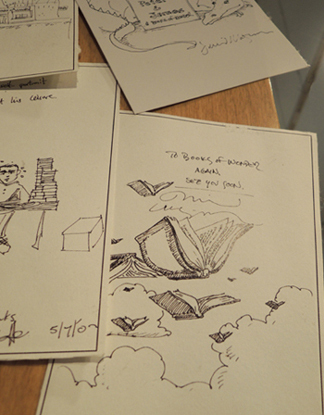 Rowboat is the author and illustrator of Rude Cakes (which I love, and which we story timed here). His newest book is Pete With No Pants. 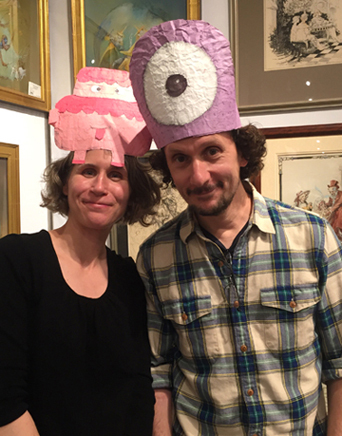 Not only did I get a signed copy of Rude Cakes, Rowboat let me model his awesome headgear. 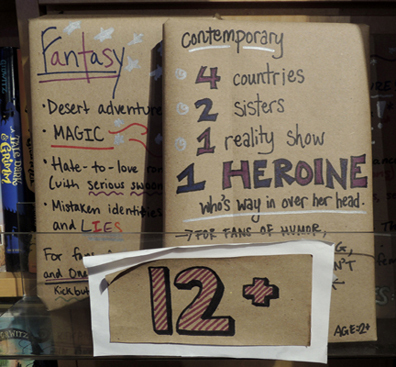 Essentially, it’s a book wrapped in brown paper with a suggested age range, genre, and enticing teaser. YES! One more fantastic detail. 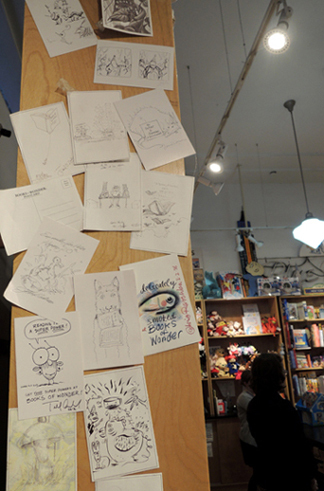 At the front of the store are thank you illustrations from visiting artists. It reminded me of the fabulous conference room walls at the Mazza Museum (which you can see at the end of this post). Katie and I spent a happy hour shopping Books of Wonder before we had to dash to catch our train. My only regret is that I spotted this cool canvas logo bag as I was walking out the door. Too late to go back and snag it, darn it! But not to worry. I’ll definitely return. In fact, in September a second location will be opening on 217 West 84th Street. 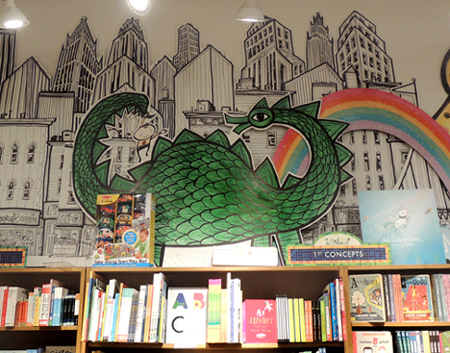 If you’re in town, definitely make Books of Wonder a destination. Just be prepared to leave with LOTS of books. 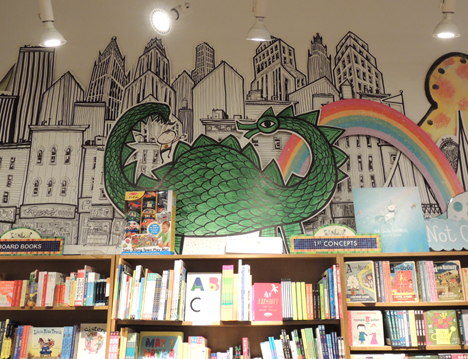 This store is bursting with love for children’s books. How can you resist taking some of the love home with you? This entry was posted in More Connections and tagged antiquarian, author, books, Books of Wonder, children, children's bookstore, first edition, Frank Baum, literacy, New York, New York City, Oz, Pete With No Pants, picture books, rare, Rowboat Watkins, Rude Cakes, signing, special by Dana Sheridan. Bookmark the permalink.